Not every swimmer competing in Saturday’s second day of the 31st annual Damon McCoy Invitational was wearing braces or still hoping for a high school diploma. Some were getting long in the tooth while competing in the sultry temperatures in the emotionally overheated environment. Consider the case of Amanda Janszen, who was in the water Saturday and swimming for more than to cut her qualifying time. Sure, there was plenty of that. After two meet records were broken Friday afternoon, three more fell Saturday morning and one Saturday afternoon as the meet rolled through another hot day. The 30-year-old Janszen isn’t about to slow down anytime soon either and wasn’t out to set a meet record. 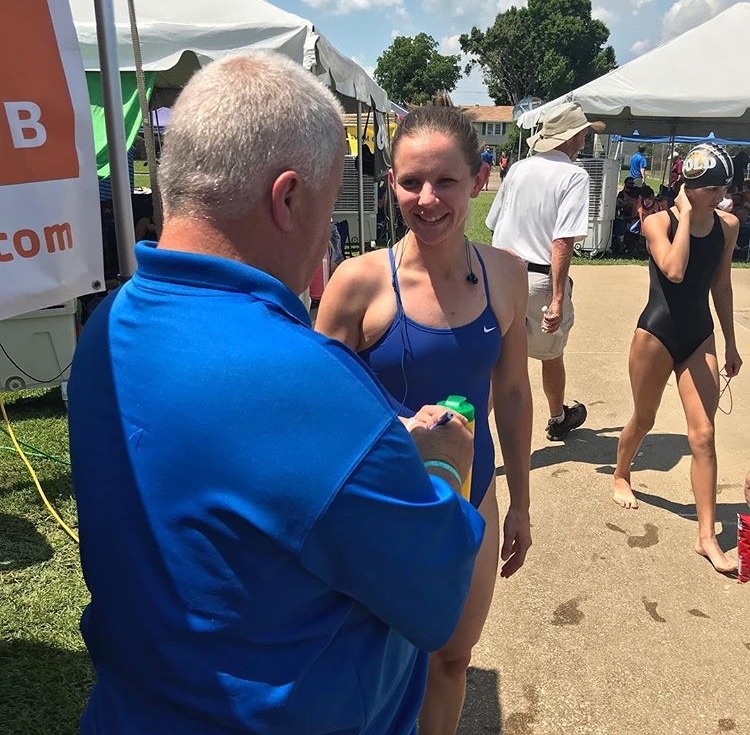 The wife of YMCA swimming coach John Janszen is a U.S. Master Swimmer who recently moved to northwest Louisiana from Cincinnati due to her husband’s job. 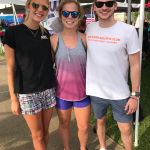 “There were lots of Masters meets about every other weekend in the Cincinnati area, but I have to drive three to four hours to find one around here,” Janszen said. 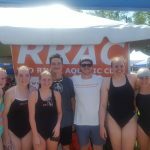 So, there was Janszen lined up at the Southside Swim Club pool against 15- to 16-year-old swimmers in the girls’ 200 butterfly, her specialty. USA Swimming has no age restrictions for its meets, so competitors of any age can swim in the oldest age bracket. The Janszens swam collegiately with Amanda competing for Depauw Unversity and John at Xavier University. Neither have branched out into triathlons, as have some in their age bracket. 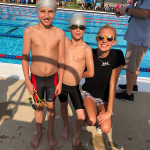 Gary Jones of the Magnolia Aquatic Club, a 12-year-old swimmer from the north Houston area, had all three of Saturday morning’s record runs in the 100 free (1:00:15), the 50 fly (29.38) and the 400 free (4:36:72). One of the records (4:39:01 in the 400) had stood since 1982 after being set by Scott Webster. In the afternoon session, Ruston’s James Hunefeld set the 200 IM record for 14-and-under boys with a 2:19.93. The previous record was 2:20.51 set in 2002. It was Hunefeld’s third record of the meet. Among the top finishes by a City of Shreveport Swim Team competitor Saturday afternoon was a third-place finish in the 50 fly by Brooke Fegley (29.27). Winning that event was Leigh McGee of the Mississippi Makos (28.64) with Jojo Daspit of Magnolia in second (28.67). The Damon McCoy event will conclude Sunday with another round of races slated to run throughout the day.